Knowing that Stream class contains int Read(byte buffer, int offset, int size) and void Write(byte buffer, int offset, int size) methods, implement in C# the NetToFile method that copies all data received from NetworkStream net instance to the FileStream file instance. To do the transfer, use asynchronous reads and synchronous writes, avoiding one thread to be blocked during read operations. The transfer ends when the net read operation returns value 0. To simplify, it is not necessary to support controlled cancel of the operation. I'm not really sure if my solution accomplishes what is wanted in this exercise, because I'm using AsyncWaitHandle.WaitOne() to wait until the asynchronous read completes. On the other side, I'm not really figuring out what is meant to be a "non-blocking" solution in this scenario, as the FileStream write is meant to be made synchronously... and to do that, I have to wait until NetworkStream read completes to proceed with the FileStream writing, isn't it? Can you, please, help me out with this? As you may have noticed, I'm stuck on the callback method, as I don't have a reference to the FileStream instance where I want to invoke the "Write(...)" method. Additionally, this is not a thread-safe solution, as the byte field is exposed and may be shared among concurrent NetToFile invocations. I don't know how to solve this problem without exposing this byte field in the outer-scope... and I'm almost sure it may not be exposed this way. I don't want to use a lambda or anonymous method solution, because that's not in the curriculum of "Concurrent Programing" course. You are going to need to use the callback from the NetStream read to handle this. And frankly it might be easier to wrap the copying logic into its own class so that you can maintain the instance of the active Streams. Even though it goes against the grain to help people with their homework, given that this is more than a year old, here's the proper way to accomplish this. All you need to overlap your read/write operations — no spawning of additional threads, or anything else is required. // and start the read operation on the new buffer. // Changed to use XOR to toggle between 0 and 1. // A little speedier than using a ternary expression. // the only time one won't exist is if the input stream is empty. I doubt this is the fastest code (there's some overhead from the .NET Task abstraction) but I do think it's a cleaner approach to the whole async copy thing. I needed a CopyTransformAsync where I could pass a delegate to do something as chunks were passed through the copy operation. e.g. compute a message digest while copying. That's why I got interested in rolling my own option. Here's what I've found and the complete source code for the program I used to test this. On my machine, these tests were run on a SSD disk and is the equivalent of a file copy. Normally, you'd not want to use this for just copying files, instead when you have a network stream (which is what my use case is), that's when you'd wanna use something like this. Here you can see the Process Explorer, performance graph as the test is run. 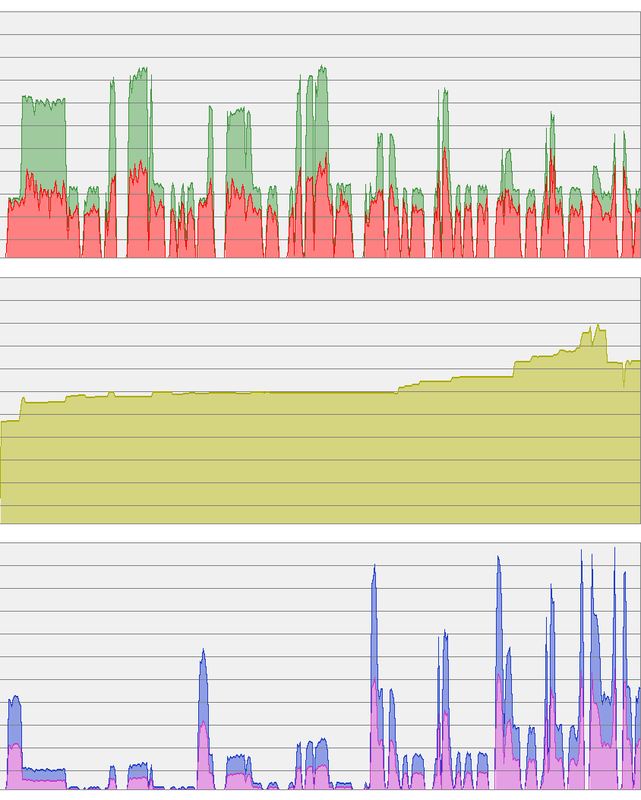 Basically each top (in the lower of the three graphs) is the start of the serial test. You can clearly see how the throughput increases dramatically as the buffer size grows. It would appear as if it plans out somewhere around 80K which is what the .NET framework CopyToAsync method uses, internally. This method of interleaving the read/write despite the huge buffers is somewhere between 18% faster than the BCL CopyToAsync. Out of curiosity, I did change the async calls to typical begin/end async pattern calls and that did not improve the situation one bit, it made it worse. For all I like to bash on the Task abstraction overhead, they do some nifty things when you write you code with the async/await keywords and it is much nicer to read that code! Wow, these are all very complex! Here's my async solution, and it's just one function. The Read() and BeginWrite() both run at the same time. /// If no data can be read for 60 seconds, the copy will time-out. // Write() instead of BeginWrite(), at the cost of speed. //  is executing in the background..
//  to make sure that the previous write is done before we write again. target.EndWrite(asyncResult); // Last step to the 'write'. if (!asyncResult.IsCompleted) // Make sure the write really completed. return; // source stream says we're done - nothing else to read. //  use the then use the other buffer for our next read. // be set when done. It's strange that no one mentioned TPL. Also consider using J.Richer's AsyncEnumerator. You're right, what you're doing is basically synchronous reading, because you use the WaitOne() method and it just stops the execution until the data is ready, that's basically the same as doing it using Read() instead of BeginRead() and EndRead(). What you have to do, is use the callback argument in the BeginRead() method, with it, you define a callback method (or a lambda expression), this method will be invoked when the information has been read (in the callback method you have to check for the end of the stream, and write to the output stream), this way you won't be blocking the main thread (you won't need the WaitOne() nor the EndRead(). Not the answer you're looking for? Browse other questions tagged c# .net asynchronous concurrency or ask your own question. Asynchronous Reading/Writing to same stream? Can starting multiple asyncronous read/write operations on the same Stream corrupt the data? Asynchronous vs synchronous execution, what does it really mean?